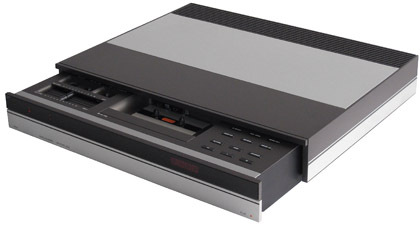 The Beocord 5000 was the cassette deck for Beosystem 5000, a new mid-range system that was geared towards multiroom operation. Beosystem 5000 was styled so that each component looked as similar as was possible, allowing a greater freedom of placement than was possible with previous models. The overall size of the system had been dictated by the size of the turntable, a sensible decision as electronics for each component could be packed into the available space, but this left a problem in the design of the cassette deck. All previous Beocord cassette models had been top-loading in some way or another, this being the ideal way to design a slim cassette machine with good mechanical performance. This would have not worked with the Beocord 5000, as one placement option was to have all the units stacked on top of each other with the turntable (top loading by necessity) at the top. The other solution, adopted almost universally in every other cassette deck of the period, was so stand the cassette upright and load it into a vertical door. This would have made the Beocord 5000 over twice as tall as the other units, so was not a practical solution. Text copyright © Beocentral. Unauthorised reproduction prohibited. The answer to the problem was to lie the cassette flat and allow the whole body of the machine to slide in and out. This most elegant solution solved all the packaging problems with no drawbacks, except for a slight increase in mechanical complexity. The drawer, which was powered by an electric motor, also made the machine instantly appear different and “hi-tech”, no bad thing as it was quite expensive compared to alternatives from other manufacturers. In order to keep the cabinet stable, the power supply and mains transformer (the heaviest part of any cassette recorder) were separated from the drawer and fixed along the rear of the main cabinet. This prevented the machine tipping forward when the drawer was opened. The opening and closing of the drawer was controlled by pressing the left most end of the aluminium strip on the front of the machine. The right hand side, following the theme of the other Beosystem 5000 components, activated “on/play” and “off”. Switching off also closed the drawer, and this happened also after 20 minutes of non-use. Text copyright © Beocentral. Unauthorised reproduction prohibited. Other than the drawer, the Beocord 5000 was fairly conventional. It fitted in the range between Beocord 2000 and Beocord 8004, and used parts and ideas from both. The mechanism came from the 2000, though it was fitted with extra sensors for automatic tape type recognition. Also from the 2000 came the “music search” function, though this was more advanced in that it was possible to search more than one “track” in each direction. The signal processing electronics were based on those of the 8004, and the same Dolby B/C circuit and HX Pro arrangements were carried over. The microcomputer was far more basic, and lacked facilities such as a timer (which was incorporated entirely in the Beomaster 5000) and real time counter. The “marker” system remained though, and a “start-go” key was added which made the machine automatically play from the start of the tape. Again following 8004 practice, a socket for an auxiliary line source and a stereo microphone was provided, complete with a selector switch. To avoid spoiling the clean lines, this too was placed inside the drawer, though the user had to remember to remove the plug before switching the machine off as the plug would then jam the closing drawer and possibly mark the cabinet. Text copyright © Beocentral. Unauthorised reproduction prohibited. Beocord 5000 could be used completely and correctly on its own, but it could also be remote controlled to a degree beyond what was possible with any previous Beocord, when used with the Beomaster 5000 and Master Control Panel 5000. Possibilities included setting up a number of timed recordings from any source from a linked room, though the Beocord 5000 retained the “record open” key on the machine itself, to reduce the chance of recording onto the wrong cassette and spoiling existing recordings. Text copyright © Beocentral. Unauthorised reproduction prohibited. Beocord 5000 proved very successful and many were sold. It was replaced by Beocord 5500, which looked identical and worked in a very similar way, though it offered extra features such as auto-reverse and the ability to monitor the recording level by remote control. Text copyright © Beocentral. Unauthorised reproduction prohibited.